A new week is here. It is crisp and chilly and feels like fall here in my neck of the woods. I am sipping a big cup of pumpkin chai latte that Trader Joe's had back in stock. A little lazy time this morning with no place I need to go to. That puts a big smile on my face. I have a new journal page for Art Journal Journey. The theme this month is back to school, hosted by Elizabeth. Its been a really fun theme and if you have yet to join in, you should. My page isn't exactly about school, but it is about learning which is what you do at school. 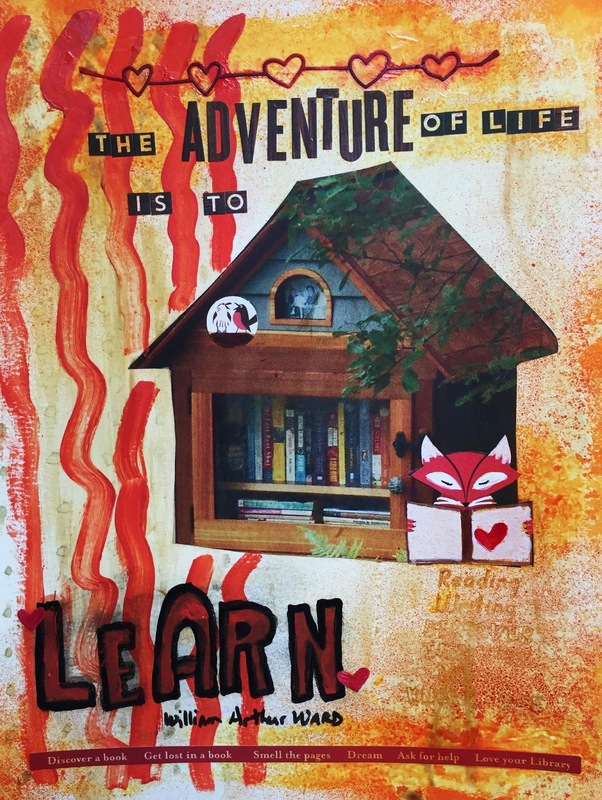 The school district I work in used to have the motto, "Making Life Long Learners", and that is my inspiration for today's page. School district motto's seem to change with each new (well not always so new) and in vogue push in the educational philosophy. So I was recently looking through one of the magazines I cut out from when I found a photo of one these little free reading libraries. Back in the early summer several photos of these cute little libraries appeared on various blogs, and since I had never heard of them, I was very curious. We don't have any of them around here, at least in the range that my travels have taken me. So when I found this photo I cut it out and decided to make a page out of it. I used a bunch of items from my stash to finish it off, as well as some paint for the background. 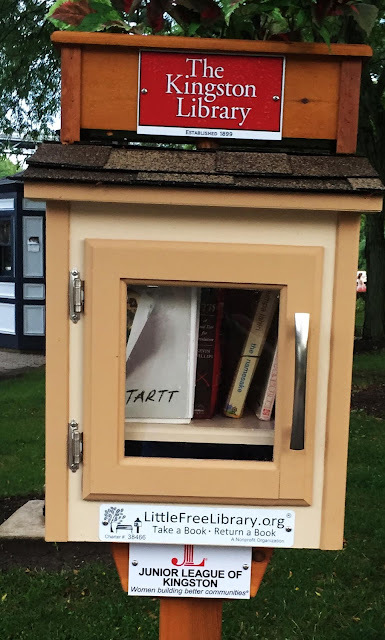 And I was quite excited, when back in August on our weekend to the Hudson River Valley in New York, I came across one of these little free libraries. So I've been having a nice weekend. The hubby's surgery is Tuesday, and he is very nervous. He's been focusing on getting the boat cleaned up and put away, as well as pulling the air conditioners out of the windows. I can do the rest of the fall clean up while he is recouping. I've been trying to deal with my stress with a little more relaxing. I also need to get myself organized for school as I'll be out for a few days and with some grades due at the end of the week, I need to get myself caught up. Have a wonderful time with the rest of your weekend. Wonderful page Erika. I have seen the little free libraries, I think it is such a wonderful idea, since I am a book lover. I pray all goes well with your hubby's surgery, as I'm sure it will. Thank you for frequently visiting my blog and leaving such nice comments. Wishing the best for hubby's surgery Erika! A fantastic page is this and I love this cute free libraries - just LOVELY! I look forward to hearing that all went well with your DH's surgery. I'd like to begin by saying BREATHE. Then, I'd like to wish your husband a safe operation and recovery. I know it's a stressful time for both of you, and unfortunately, taking time away from school couldn't be at a worse time, it seems. But you are so strong and have a positive attitude, so I know you will be brave for him while he recovers. And you will somehow manage to get the job done, as you always do. But, back on task. I simply adore your AJJ entry because it shows what is possible. I really LOVE that quote by Ward, too. I really like that background, too. Great addition to the Back to School theme, since learning and reading are very important. Your page with the free read library is very beautiful. I have never seen such free libraries, but this is a great idea! Your page is super Erika. Those little free libraries always make me smile. I have been saving my "best" books to fill a few different ones in our area. Two are at our favorite organic food markets. It is fun to see the books disappear. Sending all good wishes for your husband and his upcoming surgery. Prayers for your family and the doctors! First of all, I hope all goes well for your husband tomorrow and will be thinking of you both. I have had a super catch up today, we actually have a slow internet connection. All your journal pages and photos have been fantastic. Those free libraries are wonderful! Best of all wishes for your husband's quick recovery after the operation. I'll be thinking of you tomorrow. I've never seen one of these libraries but it sound like a great idea. What a nice page you've made for the AJJ theme. How serendipitous to do your page and then find the library! I love those, too. I don't really see them in my at-home neighborhood but there is one up north and I always like walking by it (and periodically check it out!). The page is perfect! I can't remember if I thanked you for coming over to the Gypsy so often while I was having trouble replying to comments. Your steadfast reading means so much!